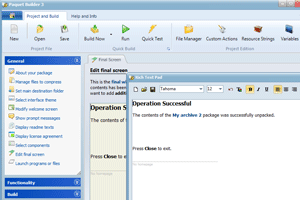 Paquet Builder is a mix between a Self-Extracting 7z archive maker, and an advanced software installation generator. 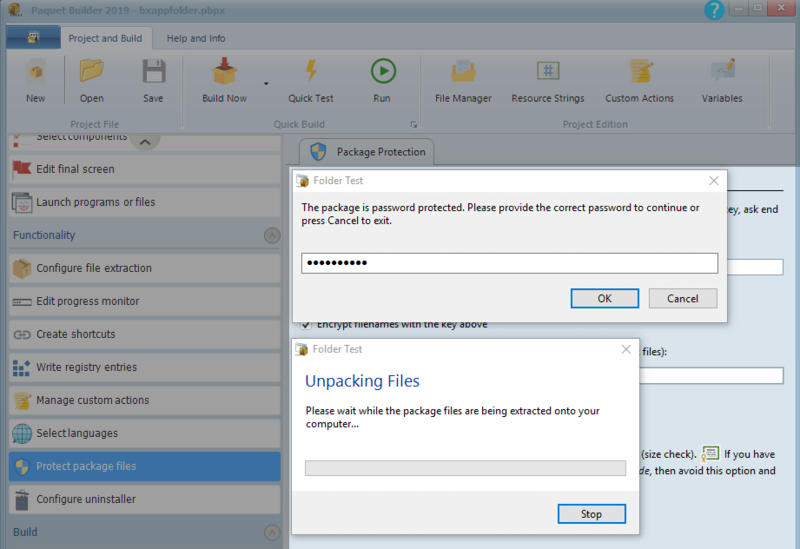 This featured-packed Windows software lets you create compact and fully-customized installer packages for professional file and software delivery. 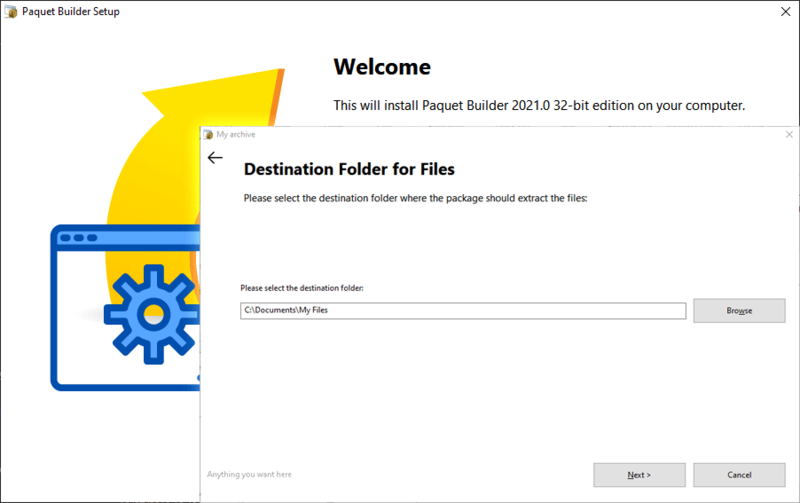 News: October 15th, 2018 - Paquet Builder 2018.1 is available with minor improvements. Upgrade is recommended. Package up any document or program files, construct sophisticated Setup routines for your Microsoft Windows™ software programs, generate updates and patches, share and install databases, wrap your multimedia presentations or even several Windows Installer MSI and MSP setup files into single .exe files ready for delivery over the Internet, construct any package for the web: everything is allowed with Paquet Builder! 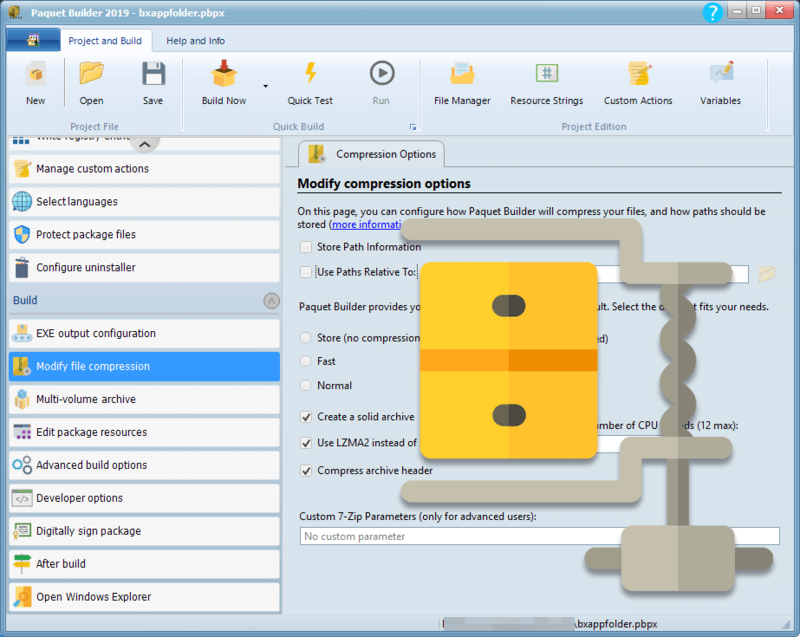 Paquet Builder uses high compression to create most compact packages available with high speed: LZMA2, BCJ2 filter, PPMD... and multi-core file compression. Save bandwidth and disk space when delivering files over the Internet. You can also convert your existing .7z archives to Self-Extracting EXE files (SFX). Show your own company information and advertisement. Packages work on any recent Windows versions: Windows 10 (all updates), 8.1, 8, 7, Vista, XP and corresponding Server editions. 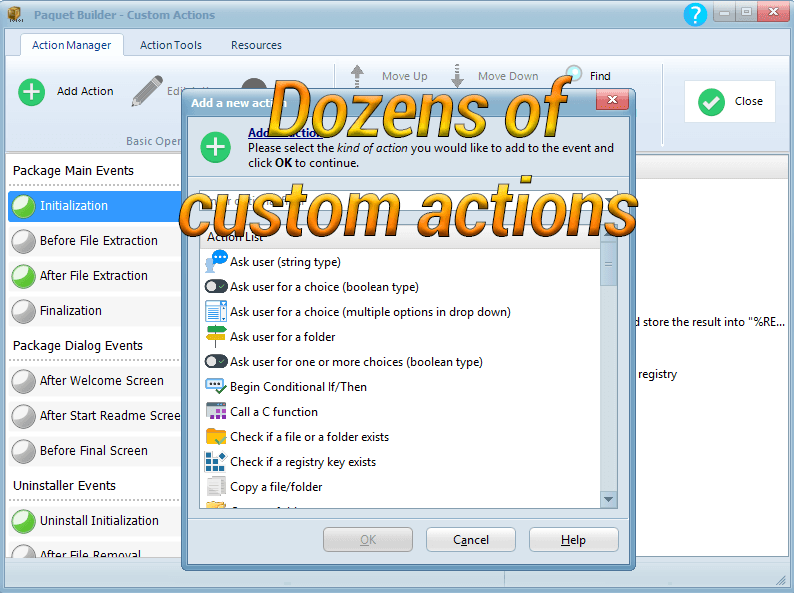 Add custom actions and configure them visually to do what you want: prompt users; detect system configuration; create shortcuts; read/write Windows registry keys, XML files (nodes and attributes) and .ini files; modify file properties; work with variables; use If/Then/Else conditionals; execute programs, open files and much more. Include uninstallers to remove changes performed by packages and installers. Organize files into components, set destination paths, ask end users for components to install, add conditions to file extraction. Digitally sign your installer (SHA-256 and SHA-1 Authenticode signing is handled) with your code signing certificates to ensure authenticity and be compatible with Windows UAC. Secure your package contents with AES and filename encryption. Protect your packages against truncated or corrupted downloads. Make multi-language packages for international distribution. Several languages are already available (French, German, Spanish...) and localization of packages into other languages is easy. 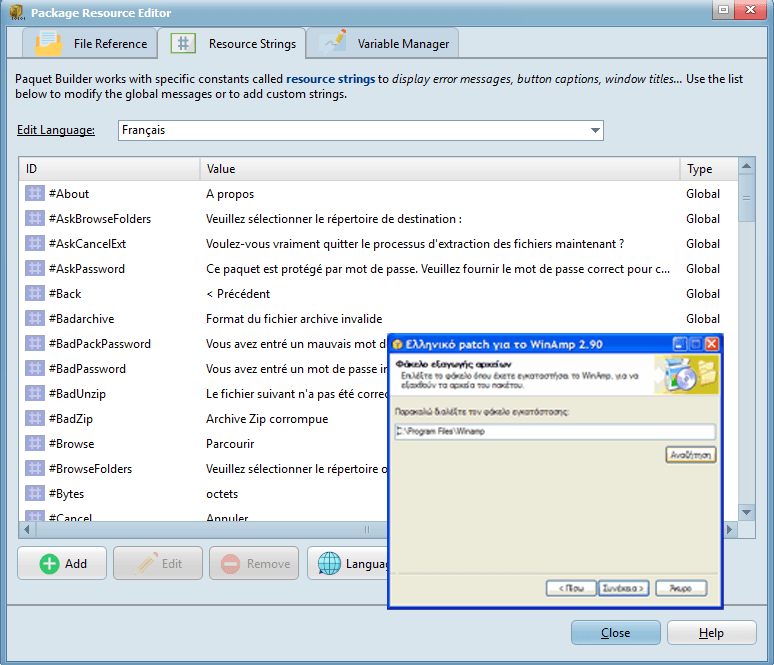 Customize any text displayed by your installers. Automate Paquet Builder to customize and create packages silently (command-line builds, directives, file inclusion/exclusion masks, batch processing). 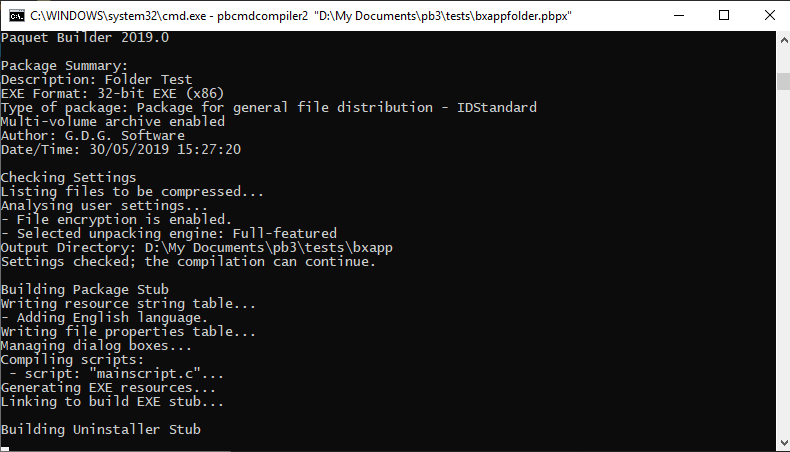 A console compiler is also available for automated builds. Exit codes are properly returned. Customize everything of your project externally thanks to text-based directive files. Small sizes for Self-Extracting EXE files: overhead is less than 256kb (small enough regarding all features and some other Self-Extractors). Build 32-bit and 64-bit (x64) installer packages to install 64-bit applications or access 64-bit Windows registry. What is a Self-Extracting distribution? A Self-Extracting distribution is a single stand-alone executable program (package) that contains compressed files and allows them to be extracted without requiring any other utility: it contains the code required to unpack these files. You just need to run it in order to get your files again. All of these features remain optional, i.e. you do not need to configure them in order to build your packages. Creating a simple package actually takes less than one minute: start a new project, add files and press Build, that's all. Then you can always modify other options later.